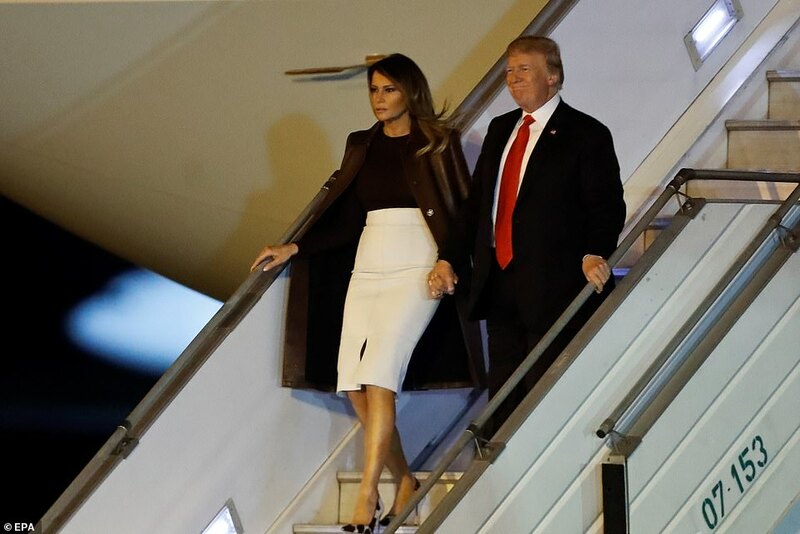 President Donald Trump looked somber as he arrived in Argentina with First Lady Melania Trump late on Thursday night for the G20 summit. 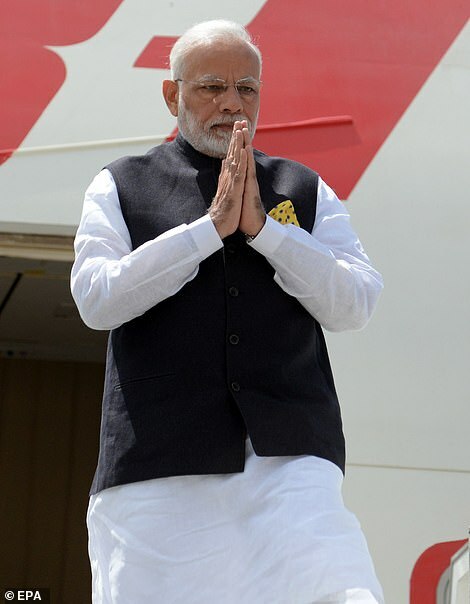 The president touched down for his whistle-stop, 48-hour trip facing mounting domestic and diplomatic pressure. It came just hours after his former personal attorney Michael Cohen admitted to lying to Congress about his business talks with Russia during the 2016 campaign. 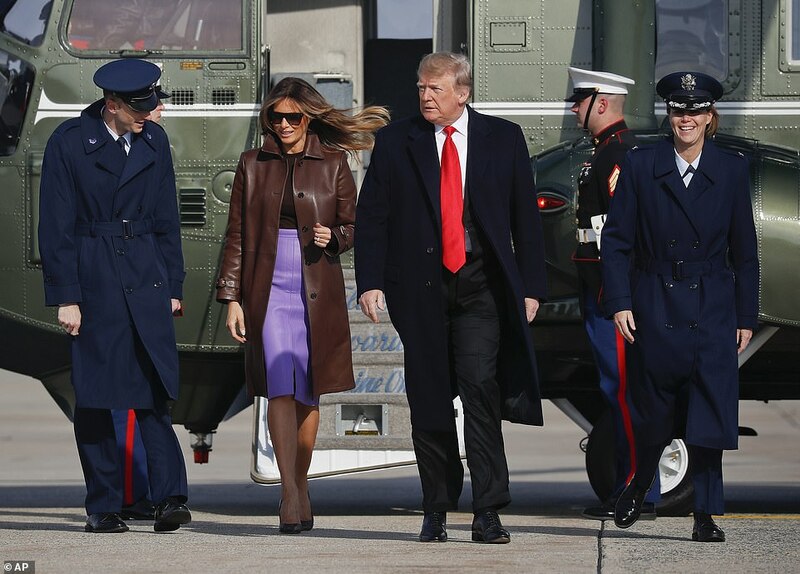 Trump exited Air Force One hand-in-hand with Melania and was followed by Secretary of State Mike Pompeo and Treasury Secretary Steve Mnuchin. 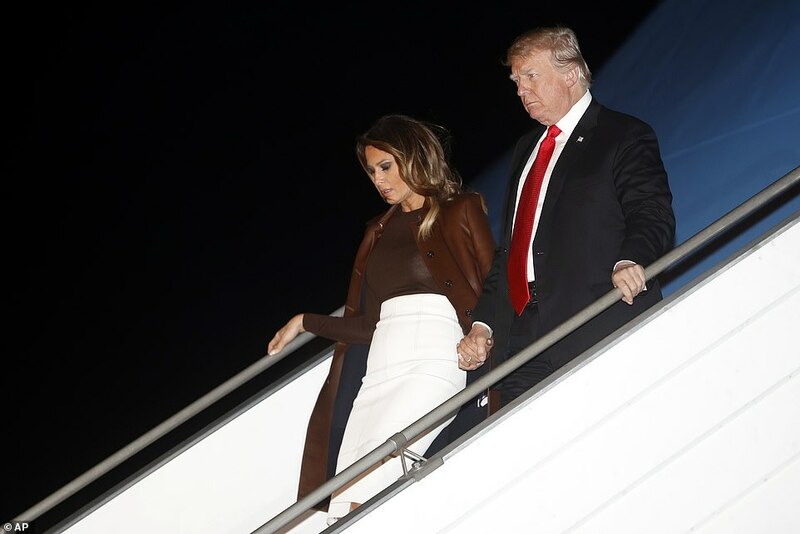 The first couple was fresh from a 10-hour flight from Washington D.C., where the president fired off tweets. He wrote that he had canceled his meeting with Russian President Vladimir Putin, offered some book recommendations and announced he was keeping Ronna McDaniel as his party chief. 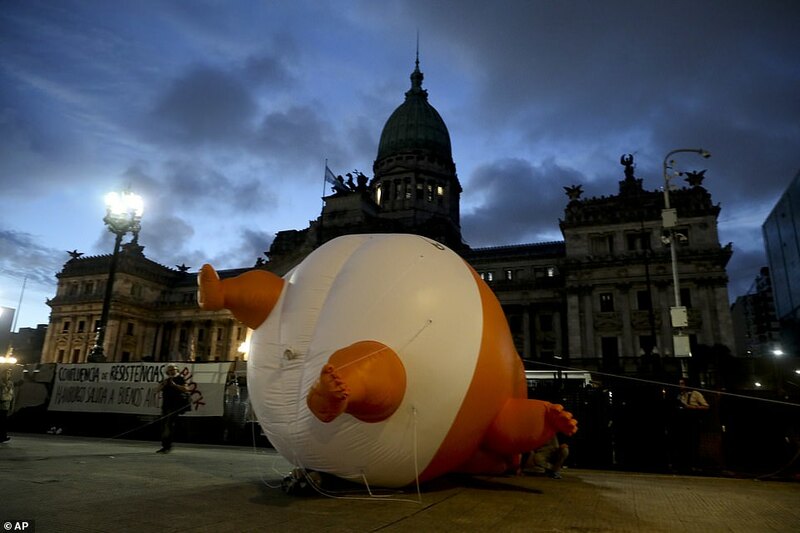 As he touched down, protesters were inflating the giant balloon that depicts him wearing a giant balloon outside Congress, in Buenos Aires, where the summit will be held. 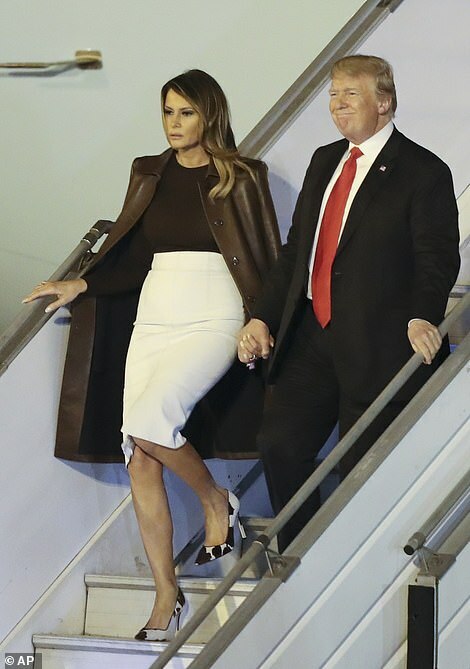 Melania Trump changed her skirt at some point before the arrival. She wore a white pencil skirt upon landing. She had left Washington wearing a purple version. 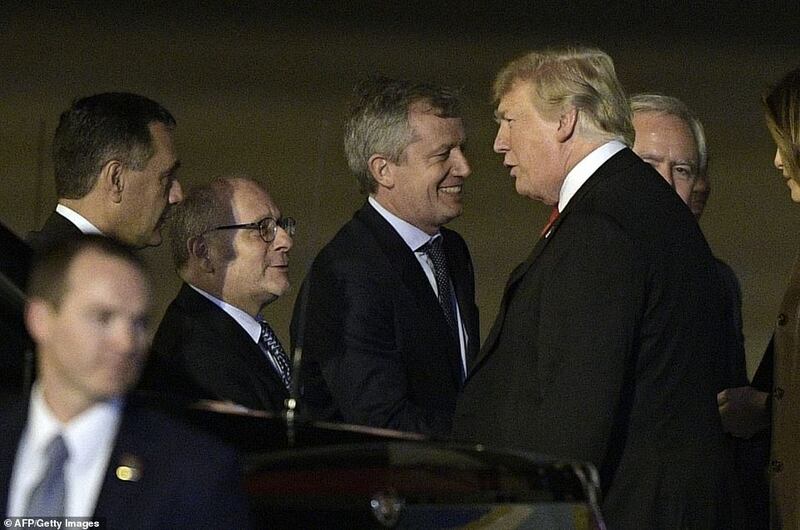 The Trumps were greeted by Argentina’s Foreign Affairs Minister Jorge Faurie, Minister for Education, Science, Culture, and Technology Alejandro Finocchiaro, U.S. 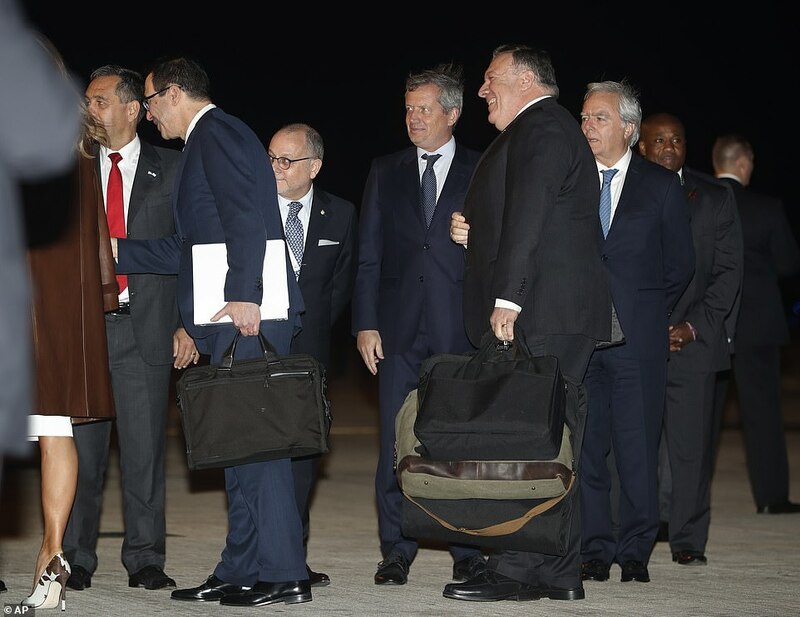 Ambassador to Argentina Edward Prado, the ambassador’s wife Maria Prado, and Chief of Protocol of the Argentine Republic Marcelo Suarez Savia upon their arrival late Thursday evening. 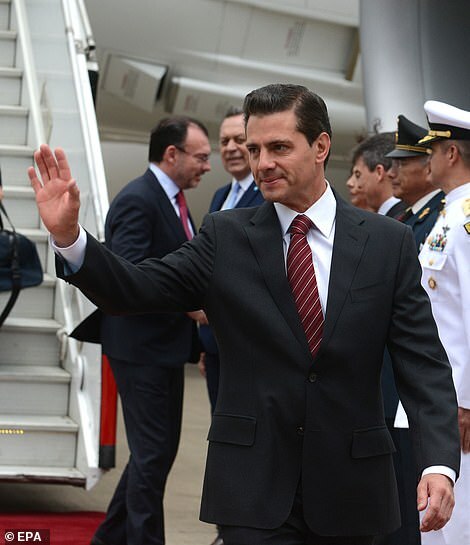 His mood will be closely observed here as he goes into two days of meetings and events with foreign leaders after he received a political and professional blow back in the States with the news of Cohen’s latest plea. The president delivered an angry denunciation of his former fixer when he spoke to reporters upon leaving the White House, calling him ‘weak’ and accusing him of lying to get a lighter jail sentence. Trump’s lawyer Rudy Giuliani fumed about the new charge Thursday and brought up the G20 summit. ‘It is hardly coincidental that the Special Counsel once again files a charge just as the President is leaving for a meeting with world leaders at the G20 Summit in Argentina,’ Giuliani wrote. ‘The Special Counsel did the very same thing as the president was leaving for a world summit in Helsinki. With regard to the hotel proposal in Moscow, the President has been completely open and transparent,’ he added. Mueller’s team indicted 12 Russians for hacking on the eve of Trump’s Helsinki summit. One detail in the Cohen case could be especially damaging to the president: Special Counsel Robert Mueller’s team charged that Cohen had promised Trump would visit Moscow personally to pitch the building project, but not until after the 2016 Republican National Convention when he would have the security of being the GOP’s presidential nominee. 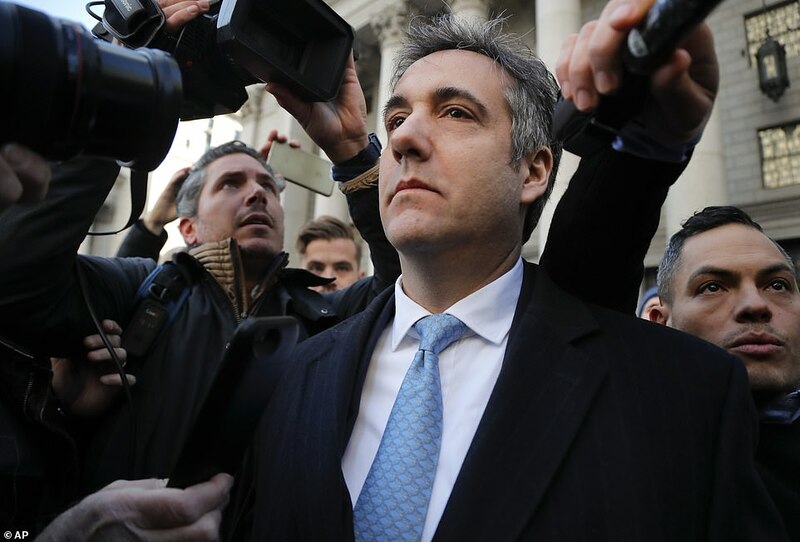 A criminal information released by the government stated that Cohen made false statements to lawmakers about the number of times he spoke with Trump about the project – and that that it continued months beyond January 2016, when he had told Congress it had fizzled. With Mueller’s Russia probe appearing to gather steam and House Democrats eager to wield subpoena power when they take over in January, pressures on the White House are intensifying. All of that is weighing on the president as kicks off an agenda on Friday that is heavily focused on legacy-shaping goals: winning his China trade war, signing a replacement for the NAFTA trade pact, managing fallout from the murder of journalist Jamal Khashoggi and baring his teeth following Russia‘s seizure of Ukrainian navy vessels. 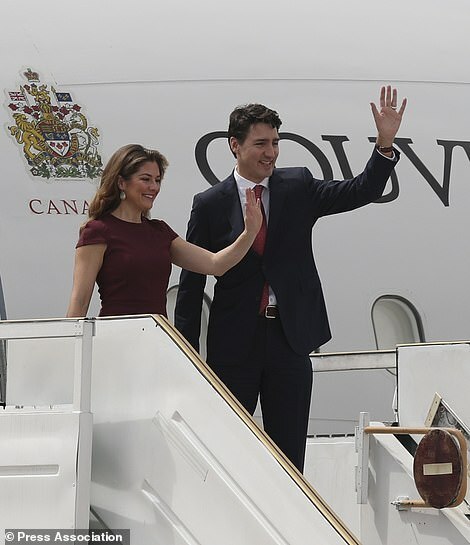 But his schedule, described by one aide as ‘full to overflowing’ earlier this week, has shrunk in the past hours. How the time will be filled remains a question. The official meetings start on Friday, but in the crowded hallways of the Costa Salguero, run-ins and off-the-cuff conversations routinely happen. And President Trump is known for going off-script. The president already dropped one bombshell before Air Force One landed when canceled a scheduled sit down with Putin, citing the seizure of three Ukrainian ships by Russian military forces. The sudden cancellation came an hour after he told reporters at the White House the meeting was on as he left to board Air Force One – only to tweet its cancelation from the presidential plane. But his sit down with his Russian counterpart would come with shadows: Saturday’s scheduled meeting would have happened a few days after Cohen pled guilty to lying to Congress. 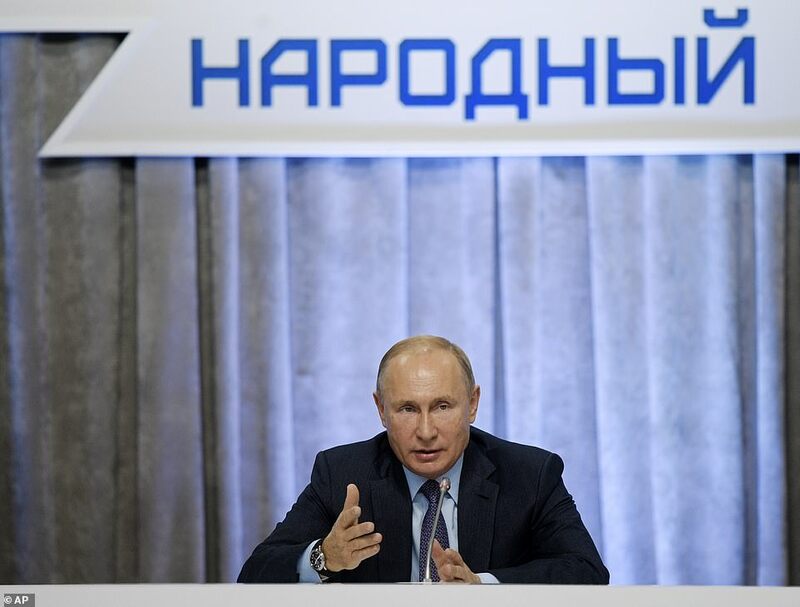 The president could have been placed in the politically uncomfortable situation of being pictured next to Putin as more questions arise about Moscow’s role in the 2016 election and international outage grows about their actions against the Ukraine. 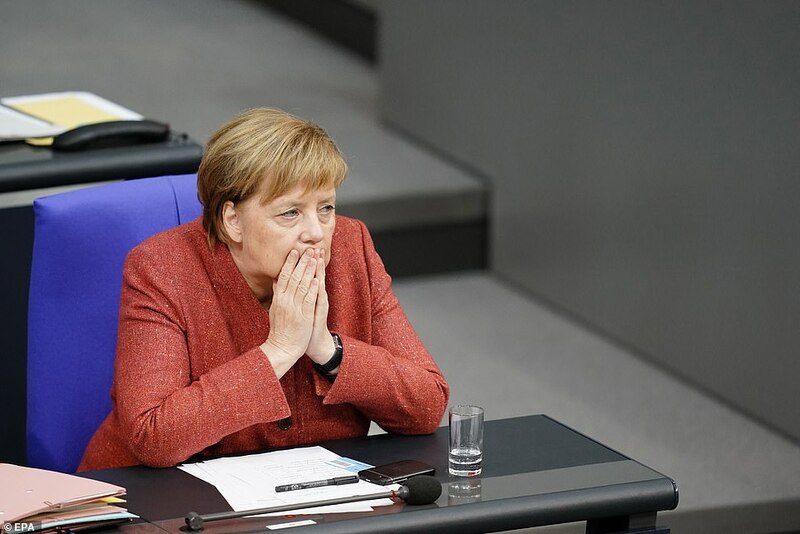 And German Chancellor Angela Merkel’s plane was delayed due to mechanical reasons, which means her schedule will need to be shuffled and it could affect her scheduled time with Trump. 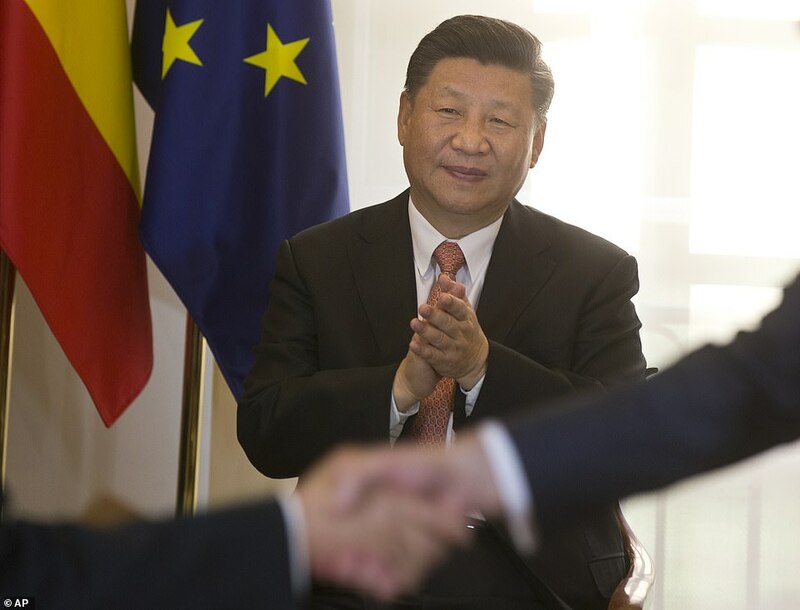 The president is scheduled to have dinner with Chinese President Xi Jinping on Saturday night amid a trade war between the economic power houses. It’s the last meeting on Trump’s agenda but the most important. 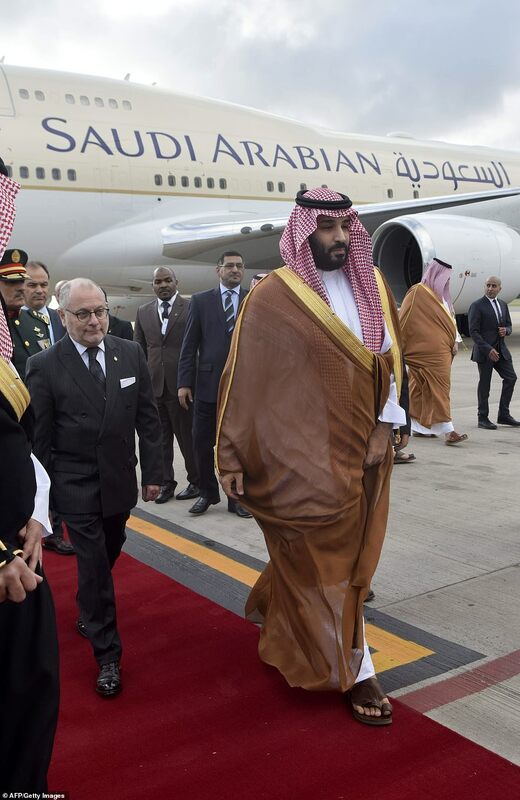 Also hovering over the president’s time here is the question of will he or won’t he speak with Saudi Crown Prince Mohammed bin Salman if they happen to cross paths while they are both on the ground here. Trump has expressed a willingness to talk to the prince, who he has defended from allegations of ordering the murder of Washington Post columnist Jamal Khashoggi. 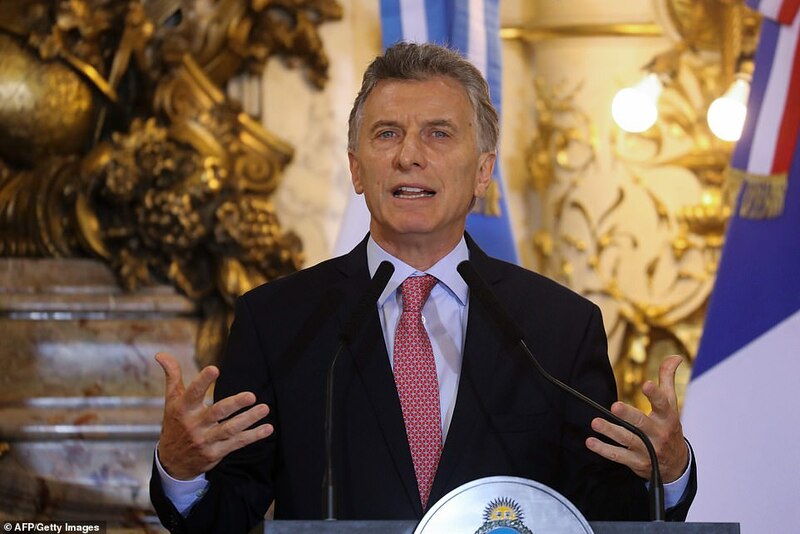 Argentine President Mauricio Macri said on Thursday that Khashoggi’s death may be discussed during the summit. 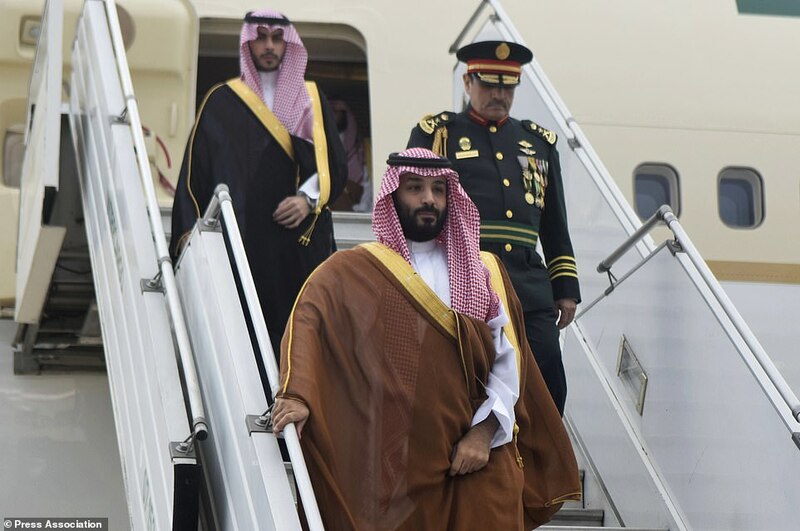 ‘Regarding the crown prince, who is attending this summit, Saudi Arabia is a permanent member of the G20. And, as such, he is attending. 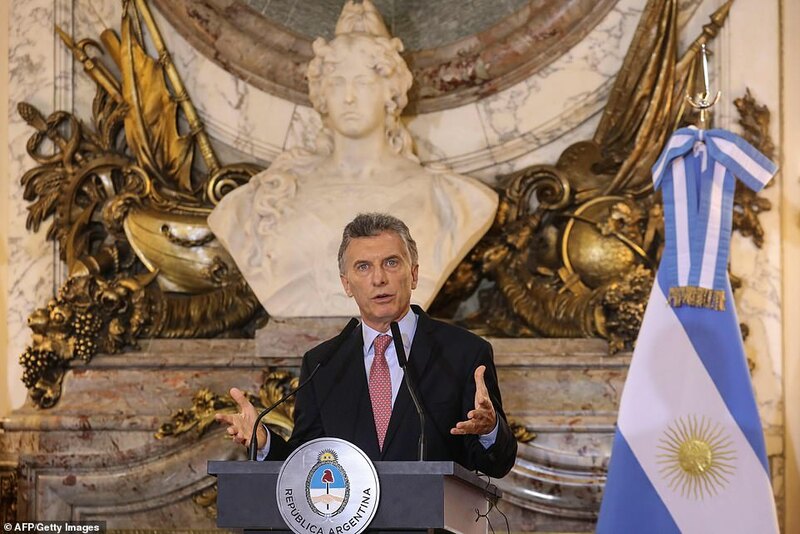 This issue, which has impacted the world, is on the table and it may come out in bilateral meetings or not, or in the G20 agenda,’ Macri said. 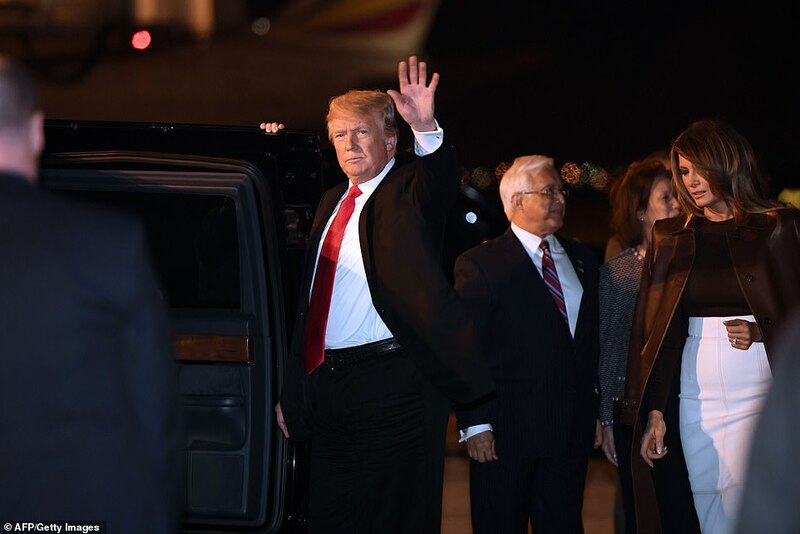 It’s President Trump’s first visit to South America and his schedule is jam packed with bilaterals, as the meetings are know. In addition to his sit down with Xi, Trump will meet with incoming Macri, Japanese Prime Minister Shinzō Abe, German Chancellor Angela Merkel, Turkish President Recep Tayyip Erdoğan, South Korean President Moon Jae-in, and Indian Prime Minister Narendra Modi. He’ll also participate in the formal signing of the trade deal between the U.S., Canada and Mexico that the president dubbed the USMC. President Trump’s Saturday night dinner with Chinese President Xi Jinping comes amid back-and-forth tariffs each nation has imposed on the other. It will be the first time the two leaders have met since the tariff wars began – at a cost of $360 billion worth of tariffs placed American and Chinese goods. They are trying to work out a new trade deal. ‘I think we’re very close to getting something with China,’ President Trump told reporters on Thursday as he left the White House for Argentina. But he also added a caveat. Trump has threatened another round of billions in tariffs if China can’t make a trade deal. ‘If we don’t make a deal, then I’m going to put the $267 billion additional on’ at a tariff rate of either 10 percent or 25 percent, he told the Wall Street Journal earlier this week. But Director of the National Economic Council Larry Kudlow said Tuesday the president is optimistic both sides can come together for a deal. ‘In his view there’s a good possibility that a deal can be made and that he is open to that,’ Kudlow said a press briefing. He said China would have to come to the table with resolutions for issues on intellectual property theft, and forced technology transfers. He added that tariff and non-tariff barriers have to be solved along with issues of ownership. ‘If China will come to the table – in this case the dinner table – with new ideas, new attitudes and new cooperation, the president has said he’s open to it,’ Kudlow said of the possibility of a deal. The trade war between the two economic super powers began in March when the administration announced tariffs on $50 billion worth of Chinese goods. Beijing retaliated with $50 billion in tariffs on American goods. Washington countered with a second wave of tariffs on an additional $200 billion on Chinese goods. And China responded with another $60 billion in tariffs on American items. Trump canceled his meeting with Putin on Thursday an hour after he said it was on. He cited the three Ukrainian ships seized by Russia as the reason. …in Argentina with President Vladimir Putin. I look forward to a meaningful Summit again as soon as this situation is resolved!,’ Trump wrote in a pair of tweets after he boarded Air Force One to fly here. But, a mere hour earlier, as he was leaving the White House to go to Joint Base Andrews for the trip, he told reporters the sit down was on after he threatened to cancel it earlier this week. He added he would receive a report on Air Force One about the incident with the Ukrainian ships. ‘I’m getting a full report on the plane in respect to what happened,’ he said. And White House press secretary Sarah Huckabee Sanders told reporters on the plane it was after reading that report the president decided to cancel the bilat. The meeting between the two leaders was to focus on security issues, arm controls issues, and regional issues including Middle East, National Security Adviser John Bolton told reporters at the White House on Tuesday. But that agenda was released before the news of Michael Cohen’s plea and the news that he had lied to lawmakers about how long his talks with Russia had gone on while Trump was seeking the Oval Office. Cohen admitted in federal court that he misled federal lawmakers about a proposed deal to build a Trump Tower project in Moscow – something he was working on in 2015 and 2016 while Trump was running for the White House. Cohen has previously said the project was shelved in January 2016, but it extended until June of that year, throughout the entirety of the Republican presidential primary process. Trump and Putin spoke briefly in France earlier this month when both men were present for celebrations honoring the 100th anniversary of the armistice ending World War I. 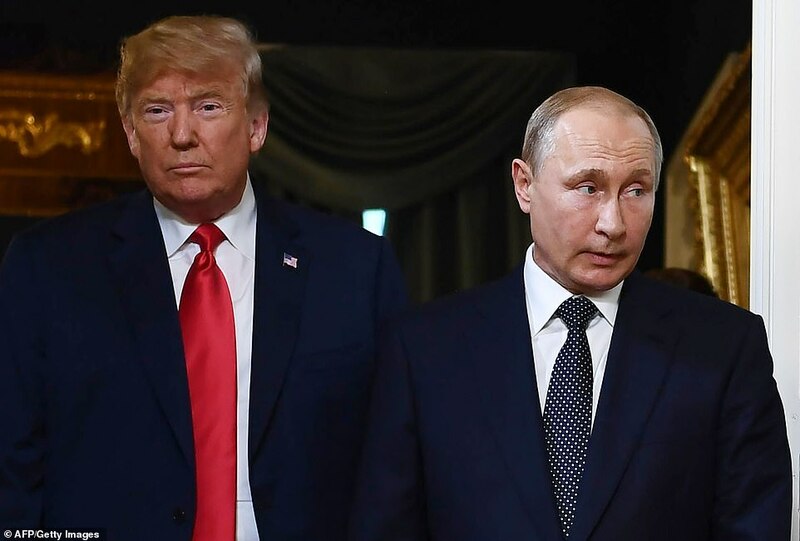 But they have not had a formal sit down since their July summit in Helsinki, where Trump was criticized for appearing too differential to Putin. One person not making the list of leader meetings is Saudi Crown Prince Mohammed bin Salman with the White House citing the president’s packed schedule as a reason. But the optics would have looked bad and raised even more questions about the president’s relationship with the controversial prince, who is close to Trump’s son-in-law Jared Kushner. Kushner will also be at the G20 but a White House official told the DailyMail.com that Jared would not meet with the prince. Trump said last week he was opening to sitting down with MBS – the crown prince is known by his initials – after he repeatedly defended the prince against allegations MBS ordered the murder of the Washington Post columnist Jamal Khashoggi. And he repeated that option to reporters on Thursday. The president has repeatedly defended Saudi Arabia as a ‘strong ally’ who has invested billions of dollars into the United States. Trump said on Thanksgiving Day that the CIA has not ‘concluded’ the Saudi crown prince ordered Khashoggi’s murder. ‘The CIA points it both ways. And as I said, maybe he did, maybe he didn’t. I will say very strongly that it’s a very important ally,’ he noted of the oil-rich Saudi Arabia. His statement contradicts reports the spy agency has determined with ‘high confidence’ that MBS – the crown prince is known by his initials – ordered the assassination, which contradicting the Saudi government’s claims that MSB was not involved. Turkish President Recep Tayyip Erdogan, whose government has led the charge against MBS for the murder of Khashoggi, is expected to use the G20 meeting as a platform to demand accountability for the journalist’s killing. 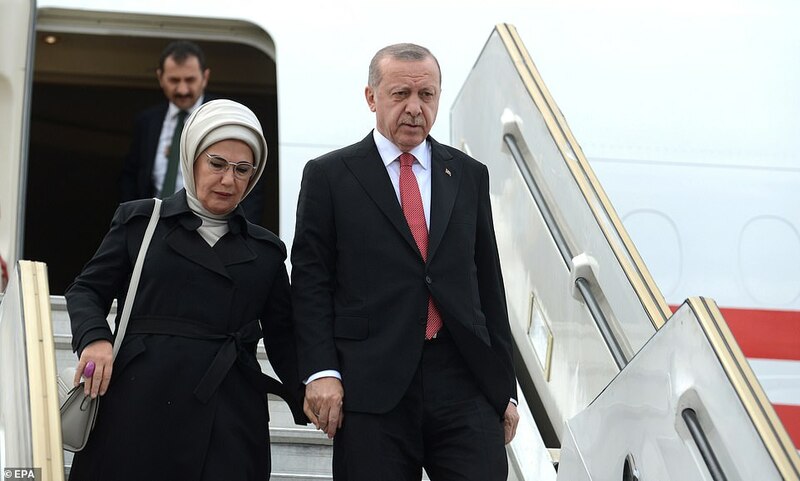 But White House press secretary Sarah Sanders downgrade the president’s meeting with Erdogan, telling reporters on Air Force One it was just a pull aside and not a formal meeting. Erdogan gave the U.S. a recording of Khashoggi’s death that is not public but has not had its authenticity disputed earlier this month as he left for an Armistice Day celebration in Paris. 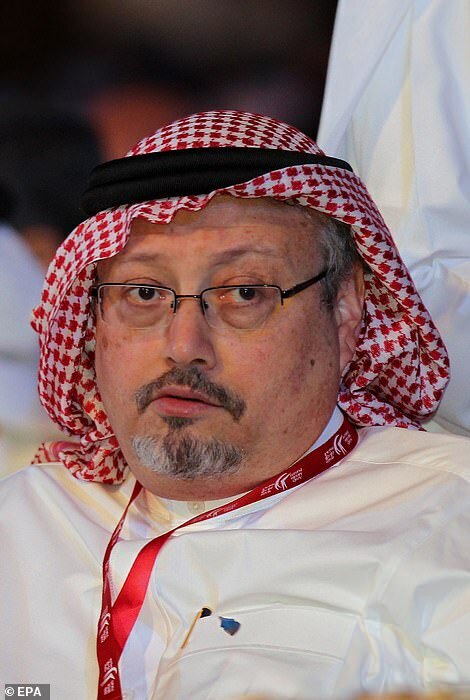 The audio reportedly makes it clear that Khashoggi was murdered but doesn’t contain a smoking gun that would directly implicate bin Salman. Trump and Erdogan discussed the murder during a dinner in Paris, the White House told DailyMail.com. German Chancellor Angela Merkel gets a bilateral with Trump – unlike her European counterparts French President Emmanuel Macron and British Prime Minister Theresa May. But it will be her last meeting as chancellor of Germany. She announced in October she will step down this fall with the election to succeed her taking place on Dec. 7. Her and Trump’s relationship has been contentious so it’ll be interesting to watch how their G20 meeting shakes out. Russia’s seizure of three Ukrainian vessels could come up as Trump called on European leaders to ‘get involved’ in the incident in an interview with theNew York Post on Wednesday. ‘Angela, let’s get involved Angela!’ he added, referring to Merkel. At a NATO summit in Belgium in July, the two leaders had harsh words for one another. Trump claimed Germany was ‘totally controlled’ by Russia and ‘a captive of the Russians.’ He also slammed the country for not contributing enough money to the NATO defense fund. ‘I have experienced myself how a part of Germany was controlled by the Soviet Union. I am very happy that today we are united in freedom, the Federal Republic of Germany. Because of that we can say that we can make our independent policies and make independent decisions. That is very good, especially for people in eastern Germany,’ she said. 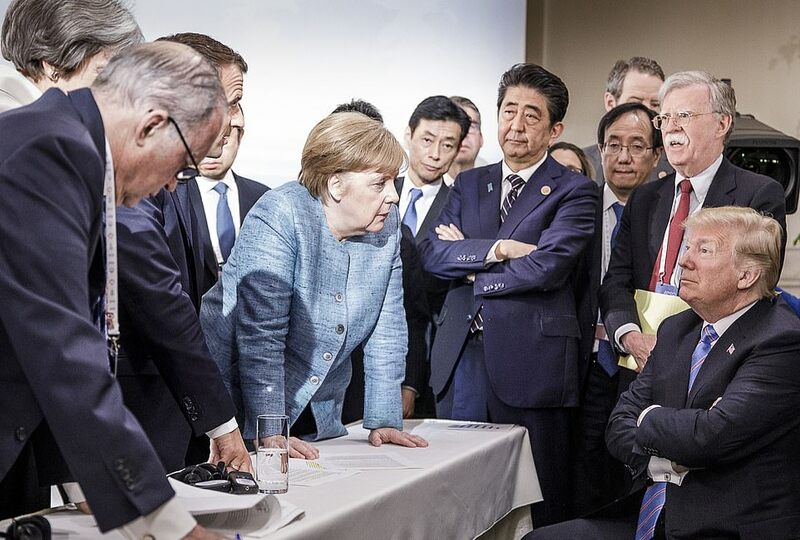 And from a June G7 meeting in Canada came the now infamous photo of Merkel staring down Trump as he sat across the table from her, arms crossed. Merkel has been in the throes of an immigration crisis in her country that threatened her government. Trump has taken a much harsher stand on the issue, saying the U.S. should close its border with Mexico and he criticized the German chancellor for her handling of the issue. The meeting of the three leaders will be an expansion of the bilateral meeting between Trump and Japanese Prime Minister Shinzo Abe. Trump and Abe have a close relationship. Abe dinned with the president at his Trump Tower residence when both leaders where in New York for the U.N. General Assembly meeting in September. 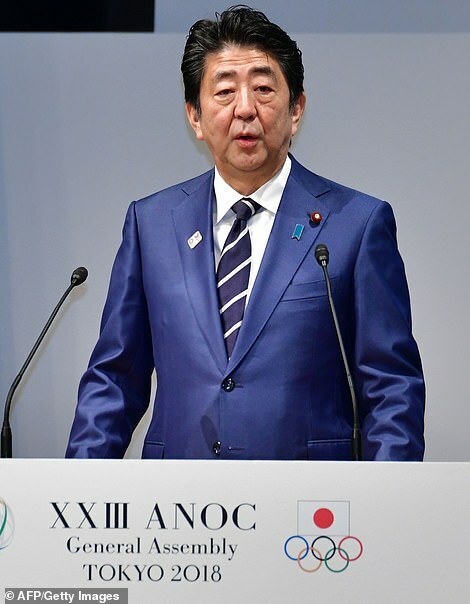 The Japanese Prime Minister told reporters the two discussed trade and reaffirmed their commitment to denuclearization of the Korean peninsula. Their meeting here comes amid renewed threats from Trump to impose a 25 percent tariff on imported automobiles, which would hit Japan hard and could result in Tokyo imposing tariffs of its own. It’s a topic that will likely come up. President Mauricio Macri is one of Trump’s former golfing partners. The two men have known each other for years. They first met in the 1980s when Macri’s father, Francisco Macri, sold his stake Manhattan property to Trump. Marci’s father wrote in his book that it was during negotiations on that deal that his son beat Trump at golf – and Trump broke his golf club in frustration over the loss. And Argentina has backed Trump’s tough stance on Venezuela. Trump’s first formal meeting of the G20 will be with Macri, who is hosting the summit. South Korean President Moon Jae-in is the man in the middle when it comes to Trump and North Korean leader Kim Jong Un. Moon has taken the lead on efforts to get North Korea to disarm its nuclear program – a topic sure to come up in his sit down with Trump. 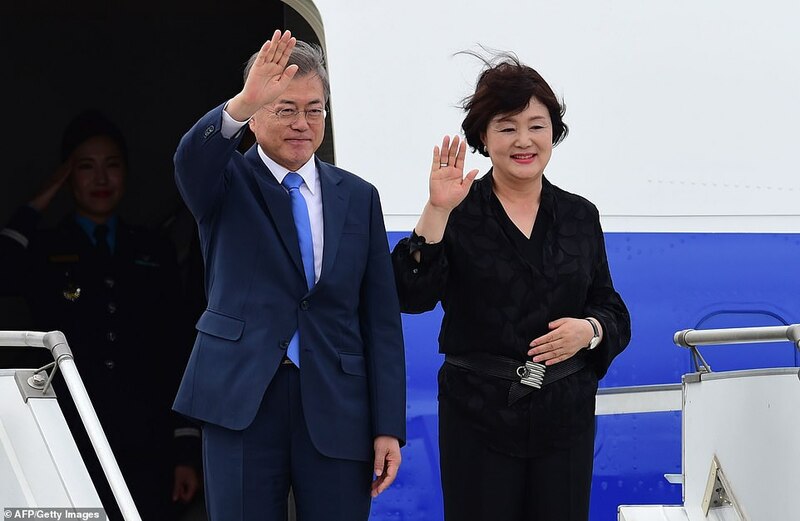 Moon has made three trips to Pyongyang and had meetings with Secretary of State Mike Pompeo. Their sit down comes as Kim is pushing for another meeting with the president, after the two met in June in Singapore. The resulting agreement they signed was criticized for not having specific goals when it came to disarming the Korean Peninsula, for a lack of deadlines, and for a lack of guarantees disarmament had taken place. Trump and Moon signed a renegotiated trade pact in New York when both leaders attended the U.N. General Assembly meeting in September. Their meeting here was also downgraded to a ‘pull aside,’ Sanders told reporters on Thursday.